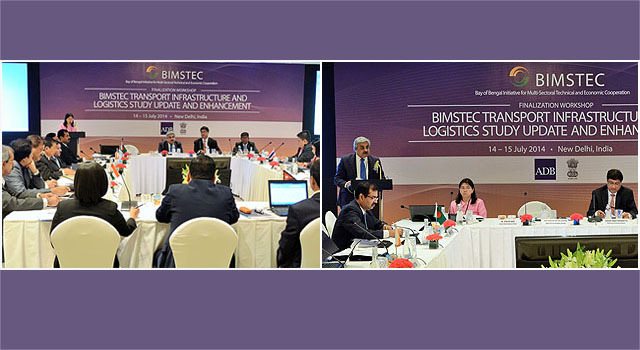 The concluding workshop for the Bay of Bengal Initiative for Multi-Sectoral Technical and Economic Cooperation (BIMSTEC) Transport Infrastructure and Logistics Study (BTILS) was held in Delhi, India, lead country for the BIMSTEC Transport Sector, on 14-15 July 2014. BIMSTEC Working Group focal persons and key BIMSTEC sector officials responsible for development of transport and logistics sectors agreed to endorse the draft Final Report of the BTILS Update and Enhancement to appropriate BIMSTEC authorities for adoption. The Final Report contains agreed recommended strategies, policies, projects, and proposed actions for implementation of the BIMSTEC Connectivity Program. Recommended institutional arrangements for BIMSTEC connectivity implementation, with agreement to name the combined working group as “BIMSTEC Transport Connectivity Working Group (BTCWG)”. The workshop was chaired by Mr. Sanjay Bhattacharyya, Joint Secretary (South), Ministry of External Affairs of India. Ms. Teresa M. Kho, ADB Country Director for India, delivered the opening remarks, which stressed the importance of strong country ownership in ensuring the BIMSTEC program’s success. In his keynote address, Mr. Anil Wadhwa, Secretary (East), Ministry of External Affairs of India, focused on the importance of implementing priority projects identified by the study to help showcase BIMSTEC. A visit to the New Delhi airport complex was arranged on 15 July, and provided workshop participants with useful insights on processes for achieving modern and secure passenger, baggage, and cargo handling facilities; for improving mobility and logistics operations; facilitating trade; and fostering greater economic integration in the BIMSTEC region. Previous BTILS workshops include the Phase I workshop held in Mae Sot, Thailand on March 19-20, 2014; and for Phase II in Dhaka, Bangladesh on May 28-29, 2014.